Andrea Rosanoff, PhD – Nutritional Biologist and co-author of “The Magnesium Factor” explains that we all need magnesium in order to balance the calcium in our food and supplements(36-39). We also need it to change the proteins we eat into our own personal enzymes (2, 32, 34, 35) and our own protein structures (32) that help build cells, bone(35) and muscle (especially heart muscle (2) and to convert food we eat into usable life energy(14, 32-34). We also need to replenish our supply of magnesium everyday. Since magnesium is constantly in motion in our cells, tissues and circulating blood, we lose a bit each day as skin cells slough off, as we sweat, as our hair and fingernails grow, and in our urine as our kidneys clean our blood. Getting enough daily magnesium from the food you eat is possible (43) but, for many, very difficult (44-46). With such crucial need, how can we be sure we have enough? Unfortunately about half of us do not get enough from our diets (47). 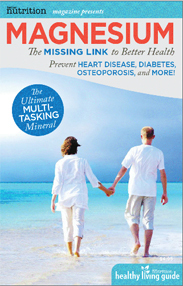 There’s not a really reliable test to determine your magnesium status (35). Your blood values can be “normal” even if your whole body is low and getting lower(49). So, how can you tell? Most magnesium is inside cells; very little is in the blood. Low cellular or unbalanced magnesium can show up as various symptoms, such as muscle cramps, anxiety, sleeplessness, constipation, migraine headaches(2, 32), depression (2, 50), high blood pressure (32, 51), high cholesterol (51), heart flutters (40), difficulty getting a deep breath (2, 57), diabetes (32, 52, 53) and heart disease (2,32, 51), including stroke. With such consequences, it can be a good idea to supplement with magnesium since oral magnesium, is very, very safe (54).